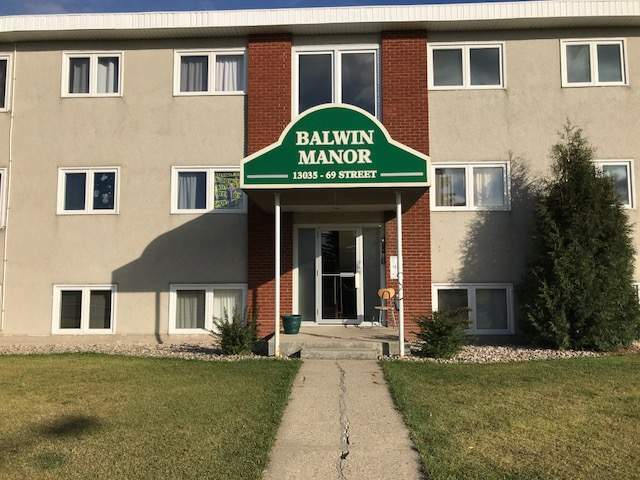 Located in the convenient and quiet north-east neighbourhood of Balwin, this building offers premium major commuting routes including the Yellowhead Trail and Fort Road, making any commute a breeze! Plus with the amenities at Manning Crossing and along Fort Road just blocks away, this community has everything you need! Various school and parks, including Balwin Elementary and Princeton School, also dot the neighbourhood, making this community the perfect place to call home! The suite has been recently updated and features new carpet and linoleum flooring throughout! The modern kitchen is complete is dual basin sink and sleek black appliances including fridge, stove and even an apartment size dishwasher!! The kitchen opens into the large carpeted living room that is filled with natural light from its massive window! The large carpeted bedroom and full bathroom complete this perfectly sized unit. Coin Laundry Services are available in the building. One Energized Outdoor Stall Included. Heat and Water Included. Only Pay Power!! Call Today To View This Gem!! !